Gedmatch.com, the preeminent "third-party" site for genetic genealogy enthusiasts, now features a SPREADSHEET option when you run your Gedmatch kit number (ie M123456) through the Gedmatch admixture calculators (ie Dodecad). 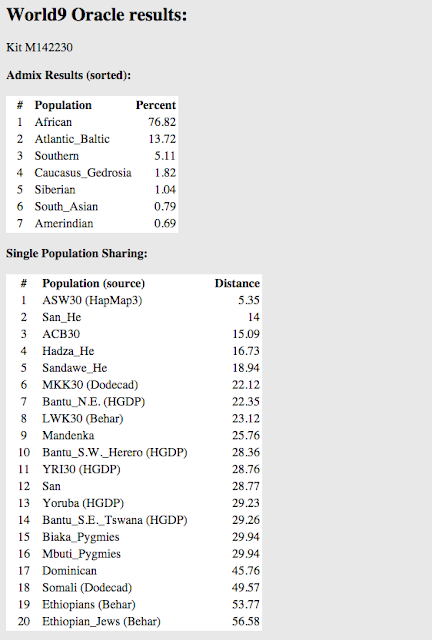 NOTE: The Spreadsheet does NOT represent your ethnicity admixture results so please refrain from using them for those purposes. 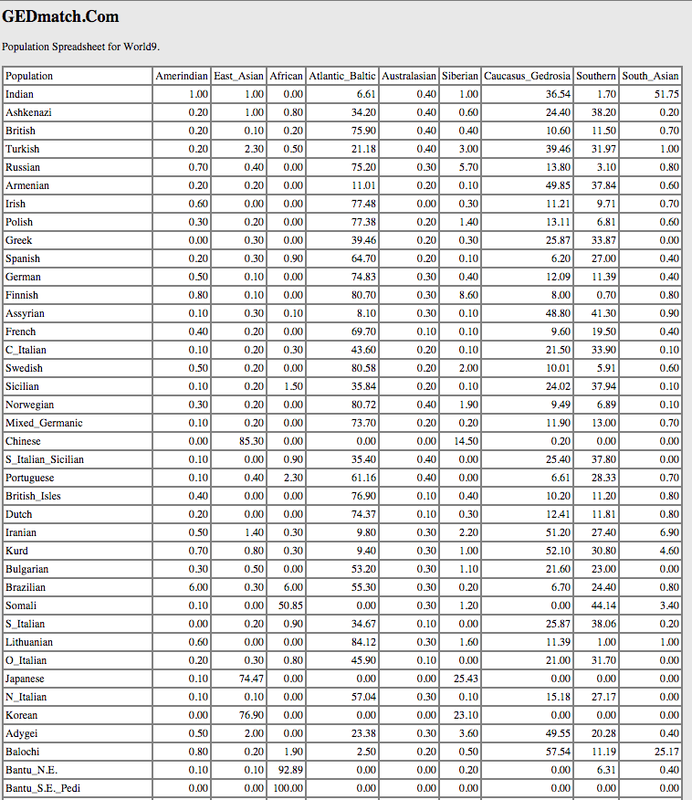 This new Population Spreadsheet corresponds to your ORACLE results (a population-fitting program measuring your genetic distance to a set of chosen reference populations based upon your Gedmatch admixture calculator results) and is best described as a utility for examining the population structure of those ORACLE reference populations. 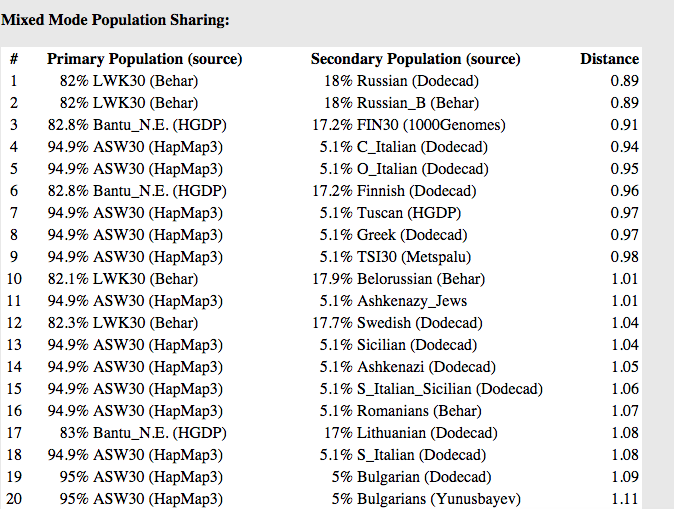 Some of these reference populations, like most of us, contain genetic ancestry from "outside" populations and some of it may show up in our admixture for those very reasons. For example we may see a small amount of Siberian on our Dodecad World9 results and think it represents Native American when in actually it has something to do with our East African affinity. Huh? 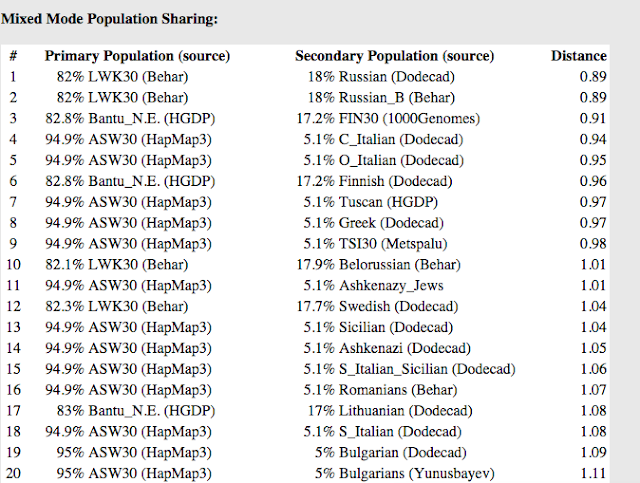 Well the Spreadsheet may help us understand what Siberian would have to do with African by examining the population structures of the Oracles reference populations. In simple terms the Spreadsheet is like taking a person from one of the reference populations used to represent an ethnicity category on Gedmatch's Oracles program and running that person's kit number through the admixture calculators. Ultimately the Spreadsheet will help us make more practical inferences about why certain admixture is showing up our results. (2) You need to see your Oracle results (below) first before you run the Spreadsheet feature. This is because you'll need to know which of the Oracle reference populations you match on the Population Spreadsheet. For example my Dodecad World9 Oracle results reveal I have genetic similarity to the Bantu NE (Northeast African Bantu). (4) On the Population Spreadsheet for Dodecad World9 (below) you will get a list of Oracle reference populations' (vertical list) admixture contributions based upon the Gedmatch admixture calculator's "ethnicity" categories (horizontal list). Think Gedmatch calculator results for each reference population in the Oracle data set. 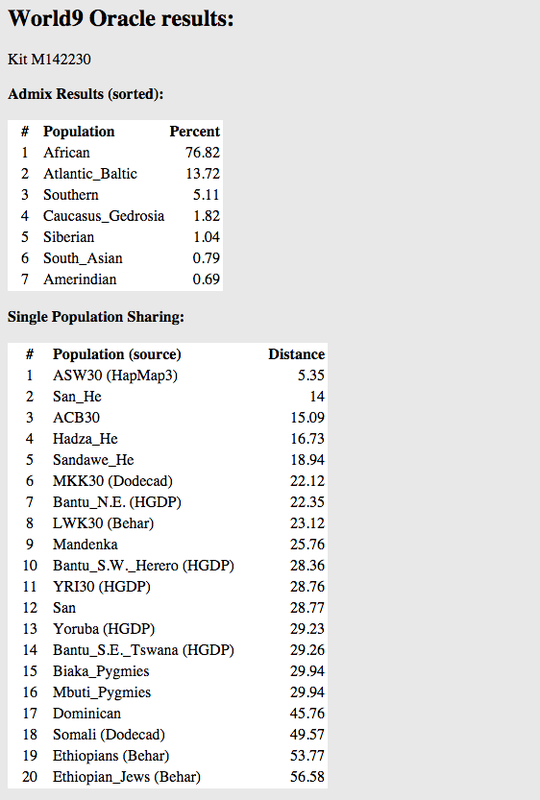 Let's look at the first population "Bantu NE" on the vertical list (second to last). 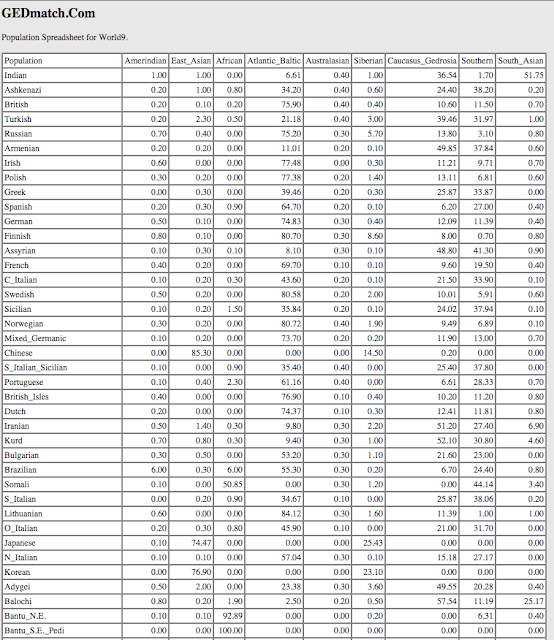 As you can see this Bantu NE sample contained African (92.89%) AS WELL AS small amounts of admixture from Southern (6.31%; Eastern Mediterranean), South Asian (0.40%), Siberian (0.20%) and East Asian (0.10%). The smaller amounts of admixture could represent such introgressions of populations (ie Southern) with ancient admixture (ie Siberian) such as could happen with Arab-Islamic contact with Madagascar (the Malagasy population is roughly 50% Bantu South African and 50% Island Southeast Asia), see Capredon et al. The majority of the Bantu NE affinity comes from Africa (multiple subregions), which makes sense if we consider the population migration and dispersal of the Bantu population, and potential gene-flow from those events. In application to my own results when I look at my Dodecad breakdown and see a strong affinity to Southern (Eastern Mediteranean), and corresponding Oracles program showing affinity to Bantu NE, I may hypothesize that the Southern percentage @ 5.51% may in part be the result of my affinity to Bantu NE shown in the Oracle program.This also means I have European, Siberian/Asian and African markers which look something like the Bantu NE's population structure and thus my higher genetic distance to them on the Oracle program. Further this could also mean I have ancestry from a Bantu population in East Africa, which also makes sense because I've known ancestry from Madagascar. 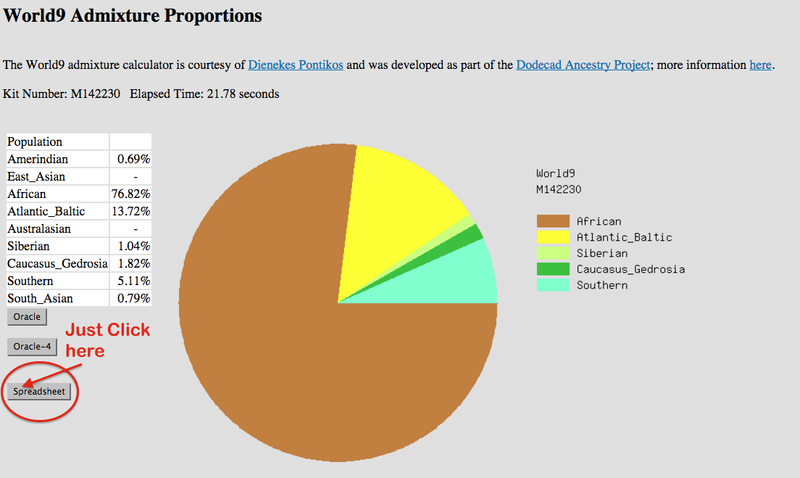 So perhaps my Southern (East Mediterranean) and Siberian admixture percentages on Dodecad World 9 is because of my Bantu NE affinity instead of Native American as I priorly assumed. 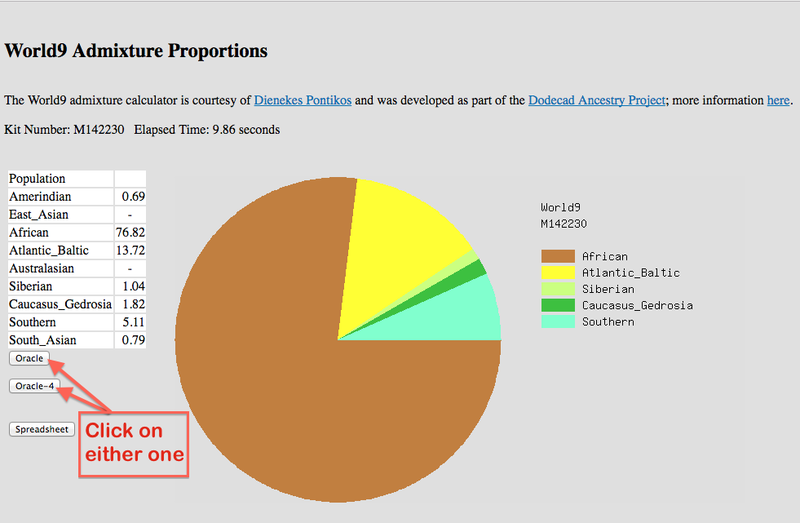 In context this may be compared to the Luhya-Kenya and Southwest Asian affinity showing on my National Genographic 2.0 admixture results, and thus lending more credence to my having ancestral origins with an East African Bantu population that may have been affected by Arab-Islamic introgression ... like my Malagasy relatives.